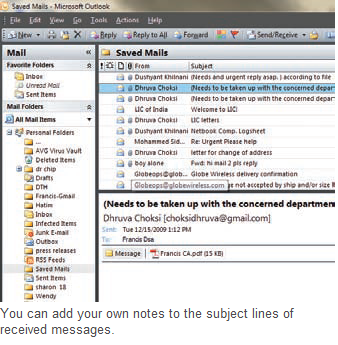 For some of the received messages you wish to attach short notes like ‘Request to call back’ or ‘Reply please’. You want to know how it can directly be attached to the message without creating elements, appointments or tasks. In an opened message you can arbitrarily change or add to the content with the command ‘Edit | Edit Message’. For short remarks it works even easier. Open the desired E-mail by doubleclicking on it. Click in the ‘Subject’ line in the header. Even though Outlook does not display any marking for editing, you can edit the subject line as desired. Insert your comments preferably at the start of the line. As you are working in the subject line, you can naturally only append short hints. Then close the message. Confi rm the question about saving the changes with ‘Yes’. This method moreover has the advantage, that you can also see your remarks later in the message overview, without having to open a particular E-Mail. Your remarks are also particularly helpful in sorting based on the subject.